NBC averaged a 4.8 adult 18-49 rating from 7:00-11:00 pm Sunday night in the preliminary fast nationals, although the final rating for Sunday’s coverage will probably be a 5.0 rating when the low-rated 7:00 half hour is excluded from the average. (The first half hour is often not rated because it does not have national commercials.) Last night is half a rating point below the same night in Turin 2006 (5.5 rating) and almost a full rating point below the same night in Vancouver 2010 (5.9 rating). Last night’s coverage included: Ice Dancing Short Dance, Men’s Super-G, Women’s Snowboard Cross, Women’s 1500m Speed Skating and Bobsled 2-Man. Yesterday also featured Christin Cooper’s ghastly interview of Bode Miller after he won the Bronze medal in the Super-G. Three follow-ups by Cooper about Miller’s deceased brother produced the desired gusher of emotional release, but even more uncomfortable were the lingering shots of an exhausted Miller collapsed in the snow. Bob Costas returns to the anchor chair tonight according to NBC. 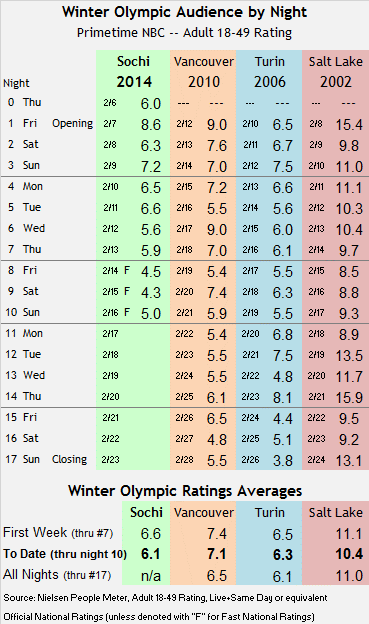 To date, Sochi has averaged a 6.1 adult 18-49 rating in primetime on NBC, now down two tenths from Turin (6.3 rating at this point) and one full rating point behind Vancouver (7.1 rating at this point in the Games). Last night was the fifth night in a row that Sochi trailed the lackluster pace of Turin (after a very strong start for the Opening Ceremony ten days ago).